What is the customs process in Indonesia to import? How is import cargo released from Indonesia Customs to importer? Import cargo clearance in Indonesia Customs. Who are the parties involved in import customs clearance formalities in Indonesia? The information provided here details on how to import goods to Indonesia especially import customs clearance procedures in Indonesia. The Directorate General of Customs and Excise (Indonesian: DirektoratJenderal Bea danCukai; also known as Bea Cukai) is the Indonesian government agency under Ministry of Finance that serves the community in the field of customs and excise. In Indonesia, an individual identity number known as the Customs Identification Number (NIK) is given by the Directorate General of Customs and Excise to importers and exporters and its registration is required to perform customs activities. This customs number enables the exporters and importers the likelihood to access or connect with the customs system. Import customs procedures required in BALIKPAPAN. Import Customs process in BANJARMASIN. Process to import to BATU AMPAR. Requirements of customs to import to BELAWAN. Customs requirements in BENGKULU to import. Customs needed to import to CIREBON. 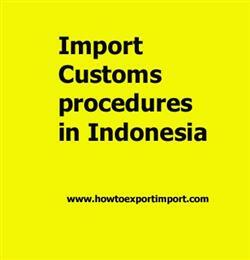 How can I clear customs to import in DILI. What Customs formalities required to import in DUMAN. What should I do to import goods in JAKARTA. How to get import customs permission in JAMBI. Procedure to get customs clearance to import in KABIL. Mandatory process need to complete import in MEDAN The way to get customs clearance process to import in PANJANG. How to export from India to Indonesia?